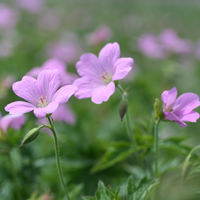 Pretty silvery-pink flowers stand above the semi-glossy green leaves of this medium-sized from late spring to midsummer. A somewhat lax, clumping, mound-shaped, nearly evergreen perennial that spreads vigorously by long creeping rhizomes, it hails from the Pyrennes Mountains of France and Spain. The five-petaled, funnel-shaped flowers have a central beak-shaped seedpod. The flower stems and leaf petioles are fuzzy. The light- to medium-green leaves are usually five-lobed and have small jagged teeth and pointed tips. 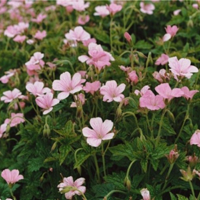 A vigorous hybrid of two European species of geranium, 'Wargrave Pink' is a hardy perennial that bears a profusion of soft salmon-pink flowers from late spring into summer. The round, five-petaled flowers have a beak-like central seed capsule. The wrinkly, deeply lobed and toothed, light green leaves form a broad dense mound.